Senior Isaiah Gonzales said he chose to come to ASK for many reasons beyond the STEM pathway. The ASK Academy was built around the Biomedical and Engineering pathways, and many of the scholars are interested in becoming engineers and doctors. There are, however, plenty of scholars at ASK whose interests lie outside of STEM. 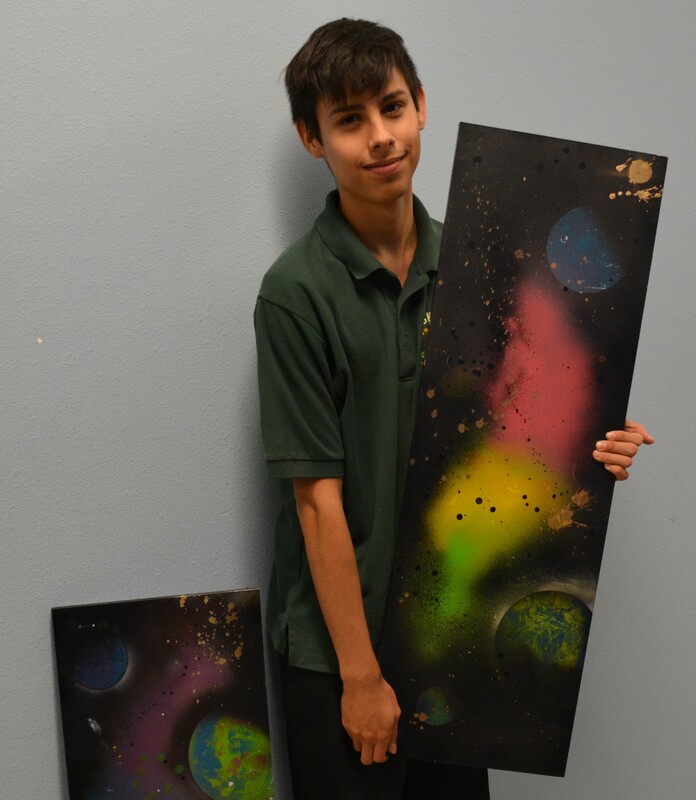 Senior Isaiah Gonzales creates artwork for project managers and scholars and spent his first RIA project researching graffiti art. He says there is a motive behind his work. “It has to do with my life story, just what I have been through. I started to rely on my art and writing in my time of depression and PTSD,” he said. Gonzales has been through a lot, but his art and writing have kept him afloat. “I got into a really bad place,” he said, “So I started relying more on my artwork and poetry to express myself in a healthier way.” Gonzales is able to continue to use art to express himself at a STEM school. There are scholars who have trouble finding an outlet for their passion, then there are those who have come to exactly the right place, like James Sanchez, a sophomore who has hopes of becoming a politician. “I want to make the world a better place; more moral, more peaceful,” he said. “I’m doing dual enrollment at CNM for political science. In 12th grade they offer an AP Government and Politics class; I’m probably going to take that,” he said. Then there are students like Jacob Molina, a junior who is interested in joining the military. He said his reason for wanting to be a marine is simple: “Patriotism.” ASK will help him when it comes to his career choice. “The ASK Attitude for sure builds character and that is exactly what the Marine Corps does,” Molina said. One the founders of the Academy, Paul Stephenson, is aware that there are scholars at this school not necessarily interested in the STEM field, and he said the school does what it can to cater to these outliers. “These students are so passionate about it, and interested and supportive of it, that we’ve created a Research in Action program for 100 percent of the scholars on campus.” Research in Action was created with the intention of letting students have free will over a topic they are interested in, and they are free to explore any field of their choice for that project. That being said, ASK Academy was made for one purpose. “The ASK Academy is a science, technology, engineering and mathematics academy of innovation. We have two career pathways, that you might even call three, and those will not change,” Stephenson said.